That was then. Now, I see plenty of motorcyclists (though nowhere near the majority), particularly long-distance riders and commuters wearing Bluetooth headsets, and who knows how many are using earbuds or custom-fitted wired earplugs? I think we’re reaching the tipping point culturally: riding wired (or wireless) is now an acceptable practice. So if you do it, what’s the best setup? I like using a Bluetooth system with speakers, so I can use earplugs to protect what remains of my hearing. That means the system has to be easy-to-use and have sufficient audio quality, both incoming and outgoing, that I can understand the words or music flowing into my earholes and people listening to me on the phone don’t hang up in frustration. I’ve had good results with systems from both Cardo and Sena, but I think the best one so far is the new Sena 20S I’ve bolted to my current-favorite helmet. The 20S is a completely new product that surprised me with its increased utility and performance. The banner headline here is the advanced Bluetooth setup. Not only does the 20S use the Bluetooth 4.0 protocol (Sena claims this is a first for the industry, even though 4.0 has been around for a few years and in fact was supplanted by 4.1 last year), it has dual Bluetooth modules, enabling both the pairing of more than one device as well as audio multitasking so you can talk on the intercom without pausing inputs from your GPS, phone or other paired devices. It also makes the transition from device to device smoother and speeds up the pairing and boot-up process. Of note to Vloggers, and I can’t believe I just typed that word, is the capability to add an accessory Bluetooth Audio Pack or Sena’s PRISM Bluetooth action camera so you can record narration on your videos. But wait, as the infomercial says, there’s more. The jogwheel is designed to be easier to use with gloved hands, you can pair up to 8 riders with the intercom, you can pair with non-Sena Bluetooth headsets (they need to support the Hands-Free Protocol), it has a claimed 1.2-mile intercom range with the little antenna raised, and smacking the headset two times activates an easy-to-use voice command prompt. Adding easy-to-use ways of interacting with your headset is a good thing—it’s hard to remember different buttons or configurations of button-presses. 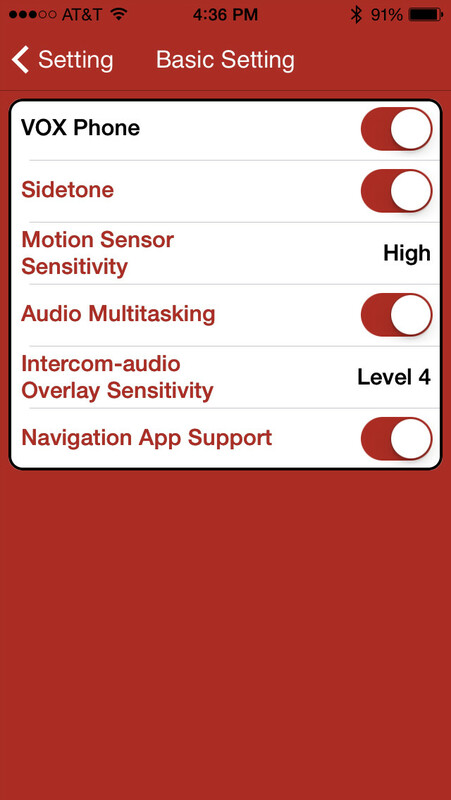 There’s also a Smartphone app for Android and iPhones that lets you program intercom buddies, radio-station presets and other features, but the coolest thing I discovered was the little button under the mount that mutes all other input in favor of an external microphone so you can listen to outside noises, be it an ambulance, your riding buddy at a stoplight or the mumbling dude in the gas-station booth. They call it the “ambulance button,” I’ve heard. The 20S is feature rich, and offers a lot of things I probably will never use, but here’s why I like it so much: it performs very well. It boots up quickly and pairs with your phone immediately. The sound out of the solid-looking speakers is crisp and clear and plenty loud, even at near triple-digit speeds with earplugs. The microphone is improved, and combined with better noise-canceling technology, the other party on the phone has no idea you’re riding a motorcycle at high speeds (I can vouch for that – ed.). Improved audio and noise canceling also means I have fewer arguments with Siri (“Call home.” “I have several businesses in Nome, Alaska that you can call. Here are the closest ones.”). The controls are also very easy to use, with intuitive operation, and kudos for adding the tapping function and eliminating voice command (although you can answer the phone by voice), which I hate (I like to sing and yell at people while I ride, and don’t need my helmet to talk back to me). 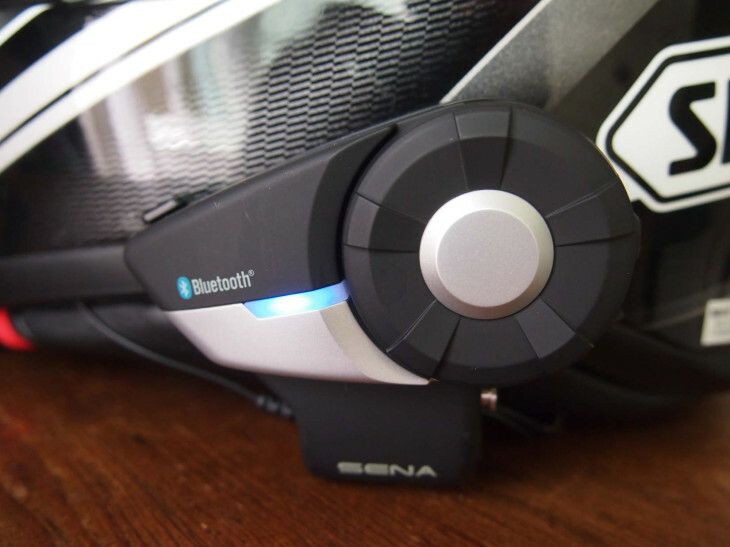 Sena did use the same adhesive on the Velcro back of the headphones it always does, so expect the vastly improved speakers to fall out of your helmet after a year or two, but you can buy replacement parts as they wear and there’s a two-year warranty. The battery life is also impressive, good for 12 hours of streaming audio with plenty of phone calls mixed in. Sena claims it’s good for 12 hours of talk time, but after about 9 hours of standby time and audio streaming and 3 hours of phone calls, the battery was done. But keep the yapping to a minimum and you can probably go for two days on a charge. If you do kill the battery, you can plug the included 12-volt charger into your bike and charge it during use if the cord doesn’t get in the way too much. Charge time is a claimed 2.5 hours. I have to admit I didn’t use the intercom much, as I don’t regularly carry passengers or ride with Bluetooth-equipped riders. And when I do, I prefer riding intercom-free to spending the 30 minutes or more it can sometimes take to figure out how to pair Bluetooth intercoms—I have yet to find a system that’s easy to pair, this model included. The thought of getting up to eight middle-aged men or women trained in this technology before I can go for a ride makes me want to reach for the Paxil or a single-shot Deringer. Enough said, and apologies for not testing that feature’s range and functionality. The 20S carries an MSRP of $299 for the single headset or $549 for the dual kit. That’s a lot of money—if you don’t recognize the utility of a Bluetooth headset. But if you’re like me, and you feel like you’re missing something when you ride without audio, you’ll find the 20S a good value. It works well and makes the ride better—and isn’t that the measure of a good product? Gabe Ets-Hokin is no longer editor of CityBike magazine and is now employed full time curled in a small ball under his desk, rocking gently back and forth. What about the FM function and reception? I am looking to upgrade and for me this is the most important feature if it works well. It functions well, but the reception isn’t great, although SF Bay area topography is tough for FM signals. I find the blue tooth coms a very welcome addition to my riding experience. I ride with a small group usually 1 or 2 other people. Being able to communicate during a 10 – 12 hour ride each day over a the weeks vacation is invaluable. Especially when we travelled over seas in europe. for instance when you are coming around a blind corner & its filled with gravel, or cattle, you can just say, “whoa, slow down there is gravel or cattle ahead!” Both hands stay on the controls & the people behind you have a few extra seconds to respond. Another benefit is that the GPS announces the directions that I have planned out right into my helmet. I no longer have to take my eyes off the road to look at my turn by turn directions folded up in the map pocket of my tank bag. Now tell me reading paper maps while riding a motorcycle just ten years ago wasn’t distracting & dangerous. Ride the motorcycle, the ride should be enough.. Why do we need another distraction?. Do you think that your awareness won’t be compromised by these distractions? The “ride” is not enough for me on boring roads, or when I am forced to travel at the same speed as the traffic. I have been listening to music on my bike since the early 1980, on cross county trips and 600 miles days out west. I, too, was sceptical at first but as with satnav I’m now a convert. Unfortunately, My Interphone F5 refuses to pair with my Tom-Tom satnav via Bluetooth (the makers say it should but I tried four modules and they are all no-go) but I really enjoy being able to share stuff with my partner as we ride separate bikes, including aspects of scenery, safety and route directions. It’s quite easy to out-ride the range though, on Bluetooth 3. Sounds as though the new Senna might be an improvement as a coms unit and I think, respectfully, that this review is very deficient in not testing it. I have no interest in phones or radio/music, just conversation when it’s valuable. I use mine mainly for music. I’m not interested in talking on the phone while riding but have fielded a few calls. Music is great when droning down the freeway and if you get into a technical mountain road, you can always shut it off. All these negative comments about such great technology – motorcyclists are such a conservative lot! I get what you are saying about enjoying the solitude of the ride but you are not obligated to leave it on all the time. Talk when it’s helpful and enjoy the silence the rest of the time. I have an earlier Sena model and find it invaluable both for group riding and for when my wife accompanies me. Used correctly it is actually a great safety item as it allows you to flag your actions to others in the group and help the pillion to anticipate overtakes etc. Try a Bluetooth headset, they are great. years ago I bought a couple chatterbox’s and regretted it. Both you and the other, need to spend a half hour in front of a mirror with your helmet on, familiarizing yourselves with the controls. the VOX, voice activated talk, was useless, even with a full face helmet, sensitivity to wind noise made it hopeless. the handlebar voice button was better. And as others have pointed out, its better just to use hand signals. I could not care less that someone would want to get in touch with me when I’m out riding. It can wait. No matter how a phone reaches a human brain, it is too much of a distraction when that brain is driving, riding, or flying. I agree. Too much of a distraction. It only takes 1 moment of distraction when you’re riding a motorcycle to end up dead. 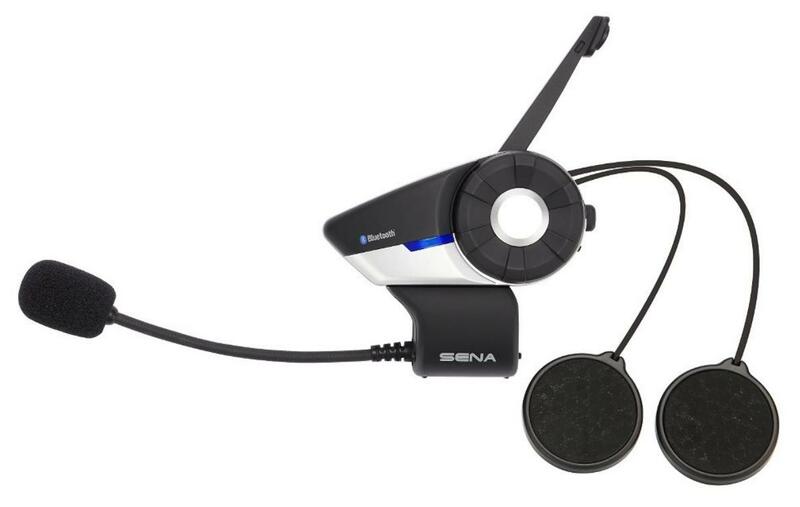 I love my Sena SM20… But i wear foam ear plugs and wish it had a tad more volume. Can you comment on the audio level relative to other Sena products? Any chance we can get a review of the Chatterbox X1 Slim? I rather begrudgingly got into Bluetooth intercoms but use the boomless mic model from UClear, the HBC200. I do not use it all the time as there are plenty of times I just don’t want the distraction. But when riding with my wife or others with intercoms it does help with communicating with others. (I had always thought flailing hands, arms, and fingers in different directions was half the fun of riding with others!! These won’t be for everyone but for those who want them it’s nice to have quality kit available.